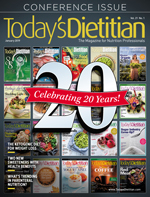 Today's Dietitian has hit yet another major milestone in its publishing history. The magazine turns 20 this year, and boy, do we have much to reflect on and celebrate. When we observed our 10th and 15th year in publishing, we reminisced about some of the most impactful trends TD covered throughout those years to keep readers informed. We're doing the same this year in our cover story, "Celebrating 20 Years," on page 20, but we're also applauding our contributions to the dietetics field that we hope will continue to shape its future. Since its inception, TD has been the quintessential independent voice for RDs in various specialties. The magazine has become a brand that has expanded its reach through readership and community engagement, social media (eg, Facebook, Twitter, Instagram), continuing professional education (CPE), and symposia. Our annual Spring Symposium, founded in 2014, attracts more than 700 nutrition professionals from around the country and abroad. For the last two years, TD has hosted a Food and Farm tour involving visits to local farms, food banks, farmers' markets, and other food organizations within the surrounding communities of the event. Each year in March, we profile and award 10 dietitians nominated by their peers as colleagues who have gone above and beyond the call of duty to impact the nutrition profession in our TD10 feature article. Our CPE program, an extension of the monthly course published in the magazine and well known as our CE Learning Library, has grown exponentially since it was established in 2012. It provides online courses and webinars presented by some of the most acclaimed nutrition professionals in the field and has nearly 68,000 users. Probably our greatest accomplishment, however, has been our news coverage of the latest research and food and nutrition trends in dietetics spanning two decades. So much has occurred and changed, and we do our best to keep you updated. Social media has made a huge impact on food and nutrition messaging, weight management strategies have shifted away from a weight-loss focus to nondieting approaches, plant-based eating patterns continue to grow in popularity, and interest in sustainable food and water systems and the gut microbiome as it relates to various aspects of health continues to build. After reading the cover story, turn to the other articles on hot career paths for RDs, the ketogenic diet for weight loss, and the latest sweeteners with functional benefits. Celebrate our 20th year with us, and please enjoy the issue!